If you would like to support the Injured Jockeys Fund by riding in a charity race then please contact the AJA immediately as Towcester Racecourse have very kindly just agreed to host their annual charity race on 4th November. Riders are asked to raise £500 each. For an application form and race conditions please contact Sarah Oliver on 01886 884488 or e-mail sph.oliver@btinternet.com. Do so early to avoid disappointment!! SIMON WALKER WINS BOLLINGER FOR 5TH TIME! 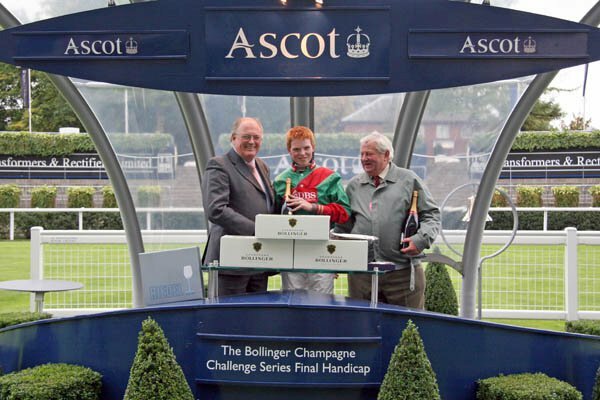 Many congratulations to Simon Walker on winning his 5th Bollinger Series which culminated today at Ascot. Congratulations also to Miles Seston on winning the runner-up position for the Series. Today’s Bollinger race was won by Tom Garner (pictured above) for Brendan Duke with 20-1 shot Bramalea who stormed home 6 lengths clear of the remainder. This was a very special victory for an ecstatic Brendan Duke, being his first Ascot winner, and the general consensus was that the Bollinger race was the highlight of an excellent afternoon’s racing. Very many thanks to our generous sponsors Bollinger Champagne for yet another wonderful series which gives so many much appreciated opportunities to our gentlemen riders. 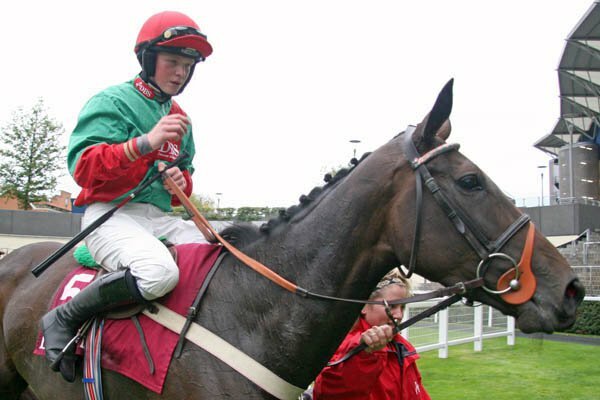 GREATWOOD CHARITY RACE AT CHELTENHAM: NEW DATE!! The Greatwood Charity Race originally planned to take place on Friday 15th October will now take place on Sunday 14th November and feature as the final race of the Open Meeting run on the same day as The Greatwood Hurdle. Riders are asked to raise a minimum of £2,500 in aid of Greatwood, the racehorse welfare charity that supports Horse Power, the unique programme whereby children with special needs learn life skills through interaction with horses. This charity race is for 4 year olds and upwards over a distance of one mile 5 furlongs and riders are to carry 11 stone 7 lbs. For full race conditions and an application form, please contact Sarah Oliver by e-mail at sph.oliver@btinternet.com or call 01886 884488. CLOSING DATE FOR APPLICATIONS IS THURSDAY 30TH SEPTEMBER. Ruth Jefferson is in Holland today for the penultimate ladies race in this year’s Fegentri series where the first four girls in the Fegentri league tables have just finished in the last four! Consequently there will be no firm result to this year’s Ladies World Championship until the final race in Mauritius in December. Whatever the outcome, Ruth has done us all proud this year. Interestingly, although the Fegentri Gentlemen’s World Championship has been won by Great Britain in the past, most recently by David Dunsdon in 2002, none of our lady riders have ever won this championship, although we have enjoyed runner-up position for the last two years respectively with Gemma Gracey-Davison and Claire Allen both making valiant efforts. Harry Challoner has also enjoyed a good Fegentri season representing Great Britain, currently lying 3rd in the rankings, and travels to Bremmen next weekend. What a week with no less than 3 Bollinger races for amateur gentlemen riders! With Aragall playing up in the stalls and having to be withdrawn, Miles Seston could only watch his grip on the series slip away as the remaining field of 8 enjoyed Goodwood on Tuesday. Many congratulations to Jake Hodson winning on Switched On for Ian Williams and enjoying his first ever winning ride under Rules. Entries and decs were so plentiful for Friday’s Chester meeting that the race was divided, giving us a welcome extra race for this years series to now total 9 races. Another of our members, 16 year old Rob Williams, enjoyed his first ever winning ride under Rules in Chester’s second division on Mr Udagawa who is owned and trained by his grandfather Bernard Llewellyn. Congratulations to Rob! The first division was won smoothly by 4-times series winner Simon Walker on tail swishing Clumber Park for trainer Richard Guest and the Clumber Park Syndicate. Simon’s second place in the second division on Dazeen earned him enough points to take him into the lead for this year’s finale which takes place at Ascot’s Autumn Festival meeting on Friday next 24th September. Miles Seston remains the only threat to Simon to take this year’s Bollinger Championship. PLEASE NOTE! BHA RACING HQ ADDRESS! Unfortunately a number of amateur jockey licence applications have arrived late into the Licensing Department recently as a result of applicants sending their forms to the old address of the BHA at Shaftesbury Avenue! If you have any queries regarding your amateur licence, please call Jo Crawforth on 0207 152 0148 or call Sarah Oliver at the AJA on 01886 884488.